Sheffield has 28 council wards, each with 3 local councillors. There are 6 parliamentary constituencies each with an MP. You can find out who your councillors are on the Sheffield City Council website and find out who your MP is here. The Green Party is active across Sheffield and we currently have councillors in 3 wards. 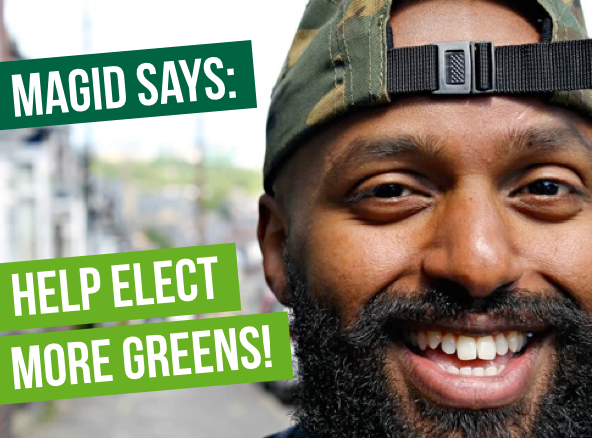 Magid Magid is Green councillor for Broomhill & Sharrow Vale ward. Get involved with Broomhill & Sharrow Vale Greens on Facebook. Read the latest news from Greens in Broomhill & Sharrow Vale. Douglas Johnson and Rob Murphy are Green councillors for City ward. Get involved with City ward Greens on Facebook. Fill in our 60 second survey so that City Ward Green Party can campaign on issues that matter to you. Read the latest news from Greens in City Ward. Alison Teal is Green councillor for Nether Edge & Sharrow ward. Get involved with Nether Edge & Sharrow Greens on Facebook. Manor Castle Greens on Facebook or check out the Manor Castle blog. Contact us at info@sheffieldgreenparty.org.uk to find out more about Greens in your ward.